Like to eat at Denny’s? There is a new Denny’s Coupon available to print. 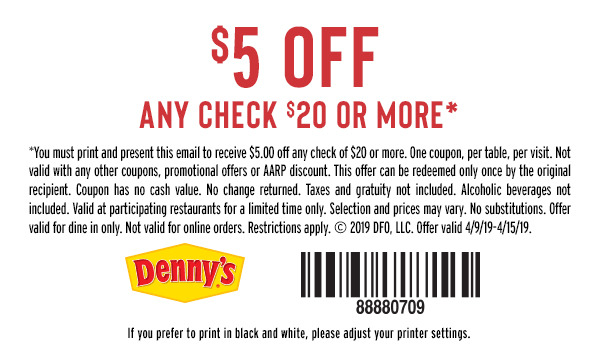 Save $5 off your $20 or higher guest check with this new Denny’s Printable Coupon. You will need to hurry though as this coupon is only good through 4/15/19. Don’t forget to sign up for the Denny’s Loyalty Program and get Denny’s Coupons emailed to you directly. Get the Denny’s Printable Coupon details below. Denny’s Printable Coupon: Coupon Details: You must print & present the coupon to receive $5 off your entire check of $20 or more. One coupon, per table, per visit. Not valid with any other coupons, promotional offers, or AARP 15% off entire check discount. Taxes & gratuities not included. Alcoholic beverages not included. Valid at participating restaurants only. Dine-in only. Offer valid 4/9 – 4/15/19. Previous articlePizza Hut Deal – The P’Zone® is Back!! Next articleOlive Garden Coupon: $1.00 Kid’s Meal!